For projects with an output up to 50 kW, we have developed a comprehensive range of modular plants. A vertical shaft and belt drive to the generator is the preferred option because it gives the client the greatest flexibility if the site information is uncertain or may change at a later date. We can supply direct drive units as illustrated below, but they are then 'site specific' with less opportunity to change the location or head at a later date. The potentially higher efficiency from a direct drive unit is usually lost by poor matching to the site conditions. The cost of a totally bespoke design is significantly higher. Many of our plants have been in continuous operation for more than 30 years during which time their simple robust construction has benefited many users who do not have access to sophisticated engineering services. HIGH HEAD PROJECTS with outputs less than 50kW use impulse turbines. For most situations we use vertical shaft 'Pelton Turbines'. The standard units cover the head range from 20 metres up to 200 metres and have one or two jets. The range may be extended into that normally associated with 'Turgo Impulse Turbines' by reducing the PCD or by adding extra jets. Each jet is either plain, with a 'gate valve'to turn it on or off, or has an internal spear to regulate the water flow over the range of flows. Jet-deflectors are usually provided for rapid shutdown in an emergency, and to protect the generator from over-speed. These turbines can operate over a much wider range of head and flow than 'turgo' or 'cross-flow' turbines, and are significantly more efficient. Stainless steel shaft and fastenings. Alternator, drive, control & protection. Medium head projects are often located at the sites of existing corn mills, and usually employ a leat (canal) to gain as much drop (head) as possible without the need for a long and expensive pipeline (penstock). If one is required it should be kept as short as possible. 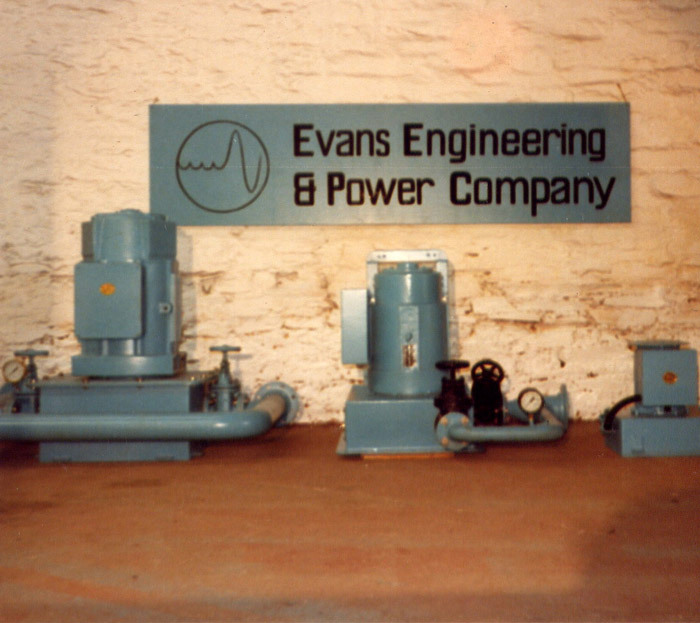 Traditional installations use 'Cased Francis Turbines', but these and even 'Pumps operated as turbines' PAT are very expensive or in the case of a PAT, very inflexible in terms of operation and matching the site conditions. 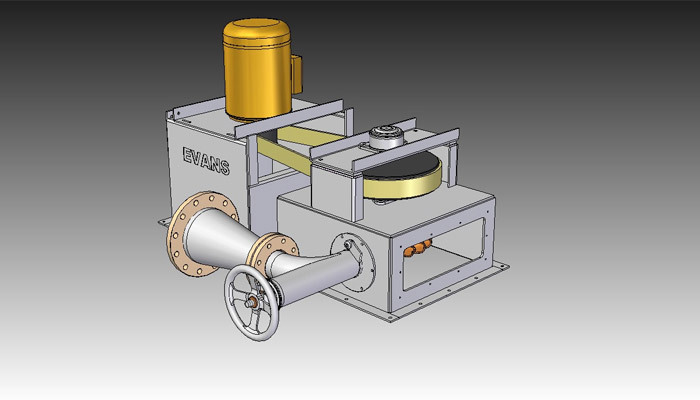 A basic turbine should be no more expensive than a PAT, but has the advantage of flexibility and higher efficiency. Axial-Flow Armstrong Turbines based on the Herschel/Jonval designs that were built in large numbers in the 19c, have better efficiency, lower cost and lower maintenance than the Cross-Flow turbines that are often proposed by others. If the plant is using a large proportion of the river flow, the capacity of the turbine will have to be adjustable. The runner and nozzles are cast in stainless steel, and offer a much stronger alternative to the welded mild steel that is used on many other turbines. Medium head projects are often located at the sites of existing corn mills, as already stated. 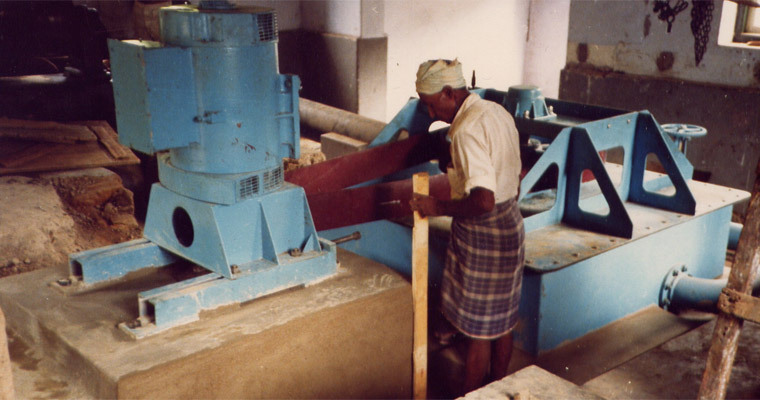 If the mill uses only a small portion of the river flow, the feed to the mill/turbine will be relatively constant. 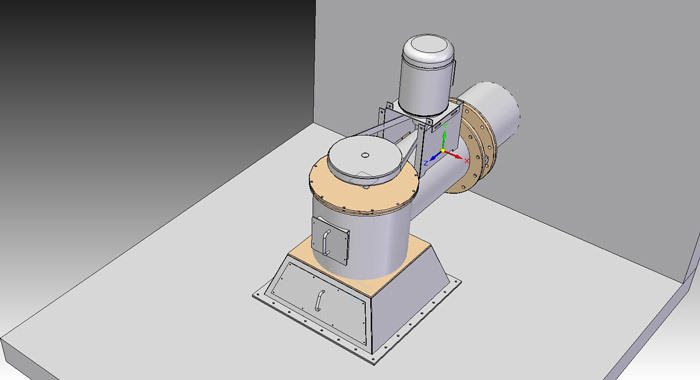 Another option where a simple ‘fixed-flow’ turbine may be used, is where there is water storage. On a large scale, such turbines may be used on ‘compensation flows’ from a dam or reservoir, at a smaller scale this may be a ‘mill pond’. Mill ponds do not increase the output of a scheme, but do allow it to operate at full power and efficiency for as many hours as the pond takes to empty. This caters for varying river flows, but the output is not continuously available. Where the main output is for heating, this seldom matters. Fixed geometry propeller turbines are used for these applications. They are simple, efficient and robust, but cannot cater for varying flows as already stated. If variation is required and there is no storage, then more than one turbine, preferably of different sizes, may be installed. 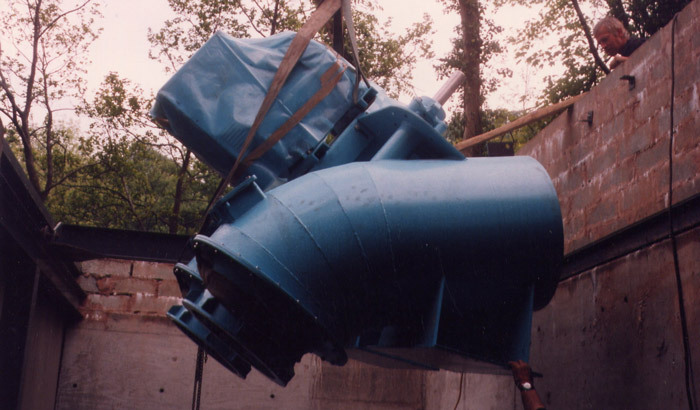 The small turbine is run at low flows, the larger turbine at medium flows and both with high flows. Two turbines installed in this way will be cheaper and more efficient than a fully variable ‘Kaplan Turbine’. 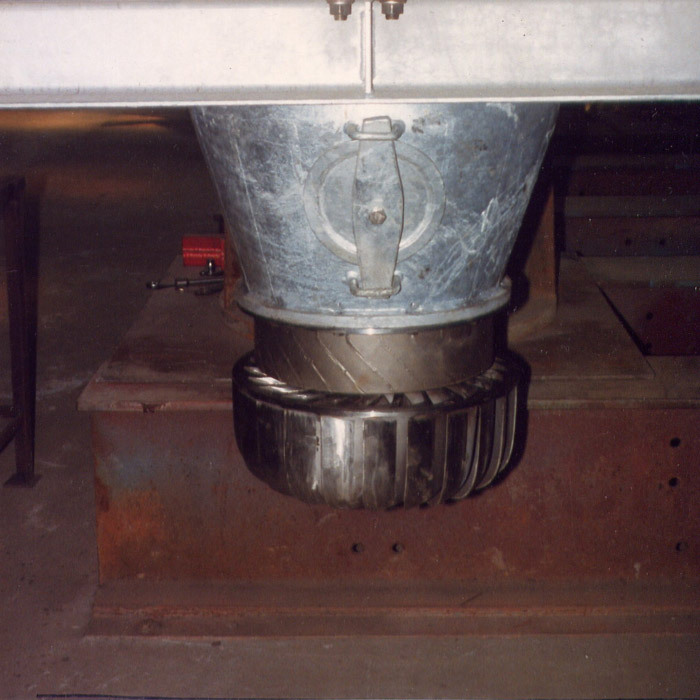 Variable speed can be used to give some degree of flow regulation. This can be achieved mechanically or electronically. Low head projects are often located at the sites of existing corn mills, or adjacent to the weirs themselves. 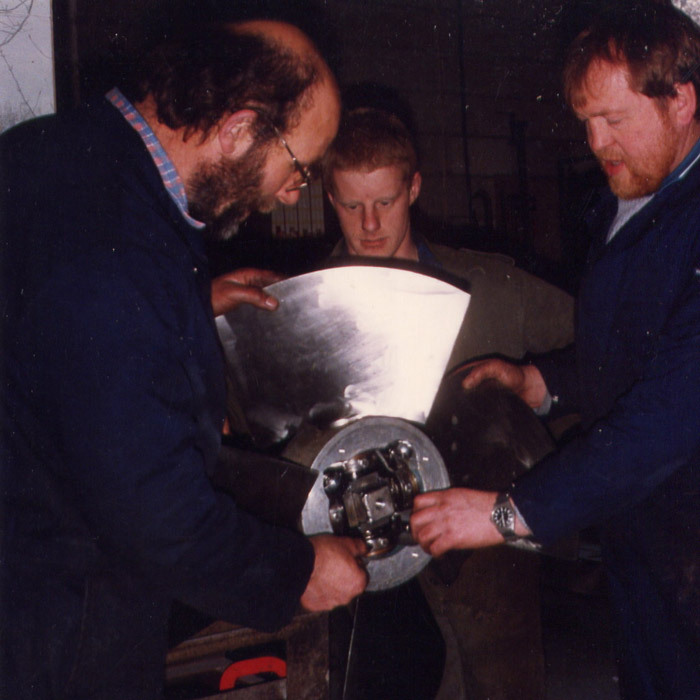 If the mill uses only a small portion of the river flow, the feed to the mill/turbine will be relatively constant. If the river has very little fall, it may be possible to run the turbine at full power for short periods when the water flows are less than the capacity of the turbine. The water level will be drawn down by a few hundred mm before the turbine is stopped automatically until the full level has again been reached, as the 'mill pond' refills. Fixed geometry propeller turbines are used for these applications. They are simple, efficient and robust, but cannot cater for varying flows as already stated. If variation is required and there is no storage, then more than one turbine, preferably of different sizes, may be installed. 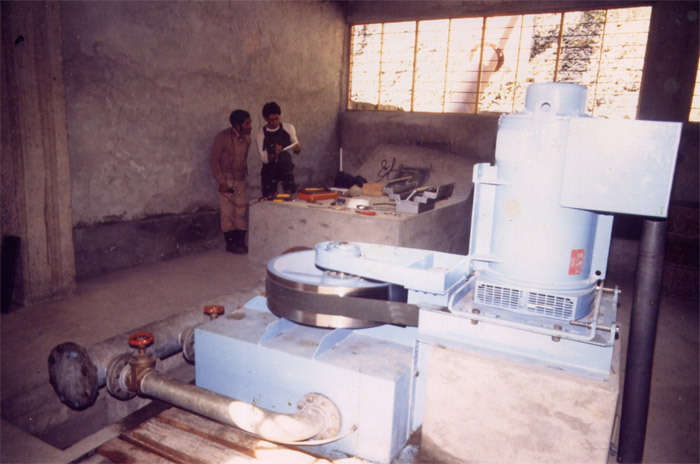 The small turbine is run at low flows, the larger turbine at medium flows and both with high flows. Two turbines installed in this way will be cheaper and more efficient than a fully variable 'Kaplan Turbine'. Variable speed can be used to give some degree of flow regulation. This can be achieved mechanically or electronically. Low head projects are often located at the sites of existing corn mills, or adjacent to the weirs themselves. 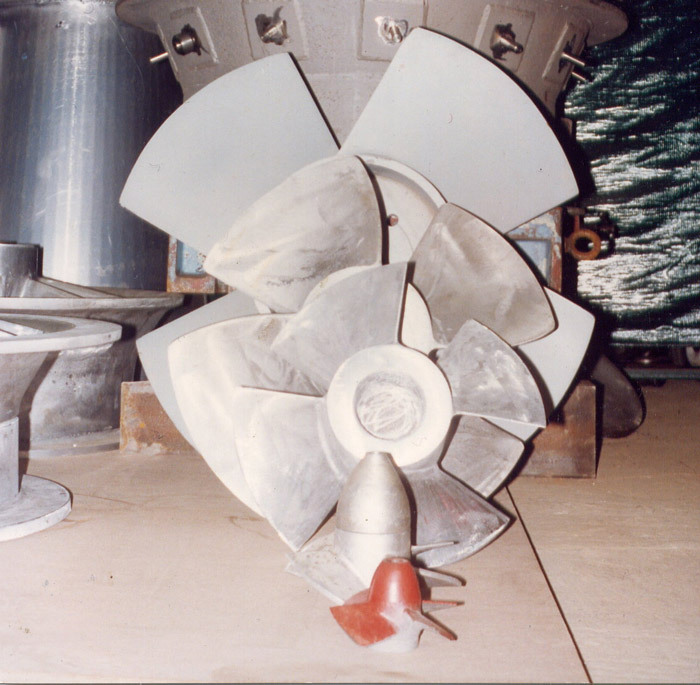 A Kaplan turbine may be the solution if a single variable flow turbine is the only feasible option. They are able to operate over a wide range of flows by altering the geometry of the vanes within the turbine and/or the RPM of the turbine. 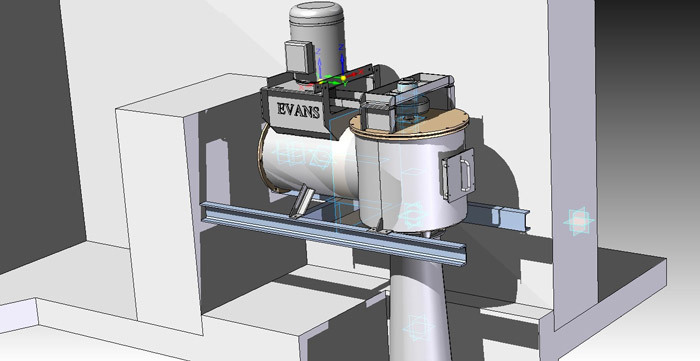 They are not a low cost solution on account of the considerable number of moving components within the turbine, but they are convenient to operate.